This coffee comes from Sede Washing Station in Konga, which is in the kebele or village, of Sede, in the Yirgacheffe district. Konga is about 4 kilometers south of the town of Yirgacheffe. Konga is known for its strong citrus and supportive stone-fruit flavors of peach and apricot, and when is combined with dry processing, the result is dried cherry, cranberry, and lemonade-like acidity. 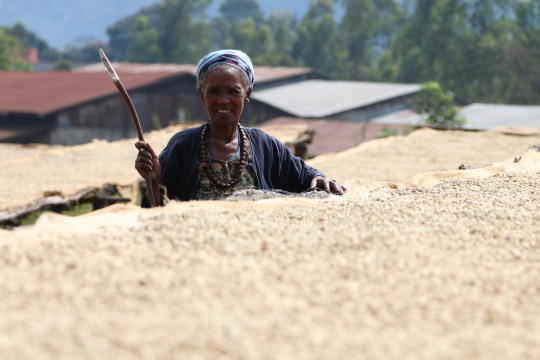 Aside from its near-legendary status as the “birthplace” of Arabica coffee, there is much to love about Ethiopia as a producing nation, including but not limited to the incredible diversity of flavor and character that exists among microregions, specifically within the southwestern Gedeo Zone of Yirgacheffe within the region of Sidama—areas whose names alone conjure thoughts of the finest coffees in the world. Coffee was literally made to thrive in the lush environment Yirgacheffe’s forests provide, developing nuanced floral characteristics, articulate sweetness, and sparkling acidity. However, coffee has also adapted to the more arid climate of Harrar, in the northeast of the country; The varieties planted there have historically had more chocolatey, rich undertones.